An old favourite this evening, pasta bolognese/bolognaise. I keep beef mince in the freezer for emergencies. What sort of emergency I’m imagining is anyone’s guess, we live 15 minutes from the centre of London and have at least three butchers and as many supermarkets and deli’s within walking distance of our front door. Still, I like to be prepared. Until I actually need to use the freezer for something and have to clear it out, hence the appearance of the bolognese this evening. I was going to make a double portion and add some pork mince to the beef and then re-freeze the leftovers. That would have defeated the purpose of defrosting the beef mince in the first place though so I went with just the beef. This was good, it’s always good but we just don’t cook it that often since there are so many other things to cook. 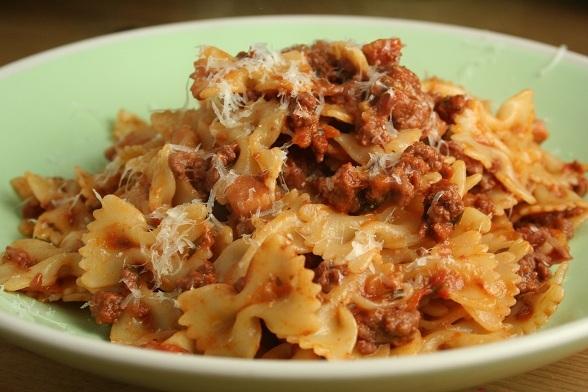 It varies each time, depending on what’s in the fridge but our basic bolognese recipe is here. This time I used dried herbs since the plants outside are looking a bit sorry for themselves and I didn’t have any fresh ones to use up. I did however have quite a lot of half-empty pasta packets hanging around so I cooked both the farfalle and the lumaconi and we had half each.